12 n Performance & Hotrod Business n January 2015 FM3 Performance Marketing Drafts Manager FM3 Performance Marketing, Grafton, Wisconsin, has added Robert Kibbe to its growing event marketing business to serve as full-time business development manager. Kibbe is a seasoned business development specialist with both OEM and aftermarket experience and will look to grow existing rela- tionships and generate new business in the arena of FM3's mobile event marketing, sponsorship management and live- event production services, according to a press release. "Bringing Robert into the FM3 family was not something we entered into lightly," said Jimi Day, FM3 president. "As the founding owners of FM3 we knew that placing someone in a highly visible position has as many potential risks as it does rewards. However, Robert is someone that both Wally Olczak and I have known for years, and his professionalism, trustworthiness and passion for the aftermarket were some- thing we knew would be a perfect fit for us. We're thrilled to have him join our team and to represent our company." Kibbe will retain his independent ownership and con- tinue hosting duties of The MuscleCar Place podcast net- work, the digital media company behind the popular weekly podcast show The MuscleCar Place, Cars For A Living and the Pro-Touring.com Podcast, the release stated. American Gasser Completes Relocation to Michigan American Gasser Inc. has completed its reloca- tion from Litchfield, Ohio, to Saginaw, Michigan—back to the roots of the principal owner, John Shelton. The move has enabled American Gasser to expand into a larger facility that includes a 2,500-square-foot showroom and 15,000-square-foot shop with multiple paint booths, full fabrication capability and clean assembly areas, according to a press release. The staff has expanded to include eight employees. "From fully fabricated frames all the way to award-winning paint jobs, American Gasser is here to support the project of your choice, as we have expanded into being a full service hot rod shop," the release noted. 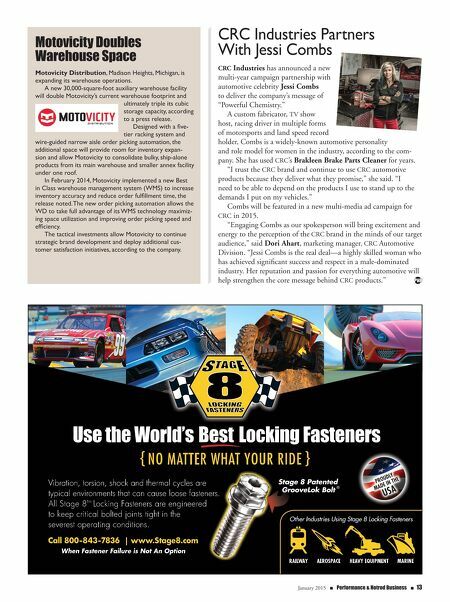 "American Gasser has helped owners upgrade their ride of choice—whether it is exhaust, engine detailing, suspension upgrades, paint jobs or a com- plete overhaul, the expertise is in the shop." American Gasser started in the roots of nostalgic drag racing, building period-correct reproductions of 1933 and 1940-'41 Willys gassers. Wheels4Hope Rolls Out New Website Wheels4Hope, a nonprofit organization dedicated to helping low-income families and individuals by providing them reliable, affordable vehicles, has announced the launch of its newly rede- signed website. The site was donated by Autoshop Solutions, a website design and Internet marketing agency for the automotive aftermarket, according to a press release. 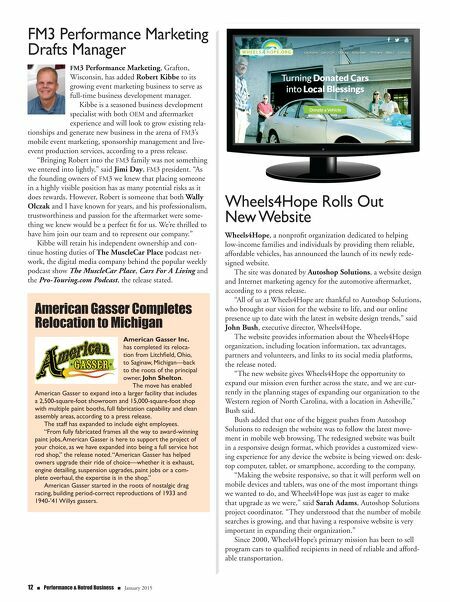 "All of us at Wheels4Hope are thankful to Autoshop Solutions, who brought our vision for the website to life, and our online presence up to date with the latest in website design trends," said John Bush, executive director, Wheels4Hope. The website provides information about the Wheels4Hope organization, including location information, tax advantages, partners and volunteers, and links to its social media platforms, the release noted. "The new website gives Wheels4Hope the opportunity to expand our mission even further across the state, and we are cur- rently in the planning stages of expanding our organization to the Western region of North Carolina, with a location in Asheville," Bush said. Bush added that one of the biggest pushes from Autoshop Solutions to redesign the website was to follow the latest move- ment in mobile web browsing. The redesigned website was built in a responsive design format, which provides a customized view- ing experience for any device the website is being viewed on: desk- top computer, tablet, or smartphone, according to the company. "Making the website responsive, so that it will perform well on mobile devices and tablets, was one of the most important things we wanted to do, and Wheels4Hope was just as eager to make that upgrade as we were," said Sarah Adams, Autoshop Solutions project coordinator. "They understood that the number of mobile searches is growing, and that having a responsive website is very important in expanding their organization." Since 2000, Wheels4Hope's primary mission has been to sell program cars to qualified recipients in need of reliable and afford- able transportation.